The following is not our firm’s case, but is typical of ones we become involved in. Lake Forest Property Owners Association v. Regina Gebauer and Taylor (Ala. App Court) The question the Court was asked to answer was whether a pig was livestock or a pet? The Association sued Gebauer claiming a 135 pound Vietnamese potbellied pig violated the neighborhood’s restrictions on livestock and constituted a nuisance or inconvenience to neighbors. The lower court ruled Taylor (the pig) constituted a nuisance and was livestock and should be banned. 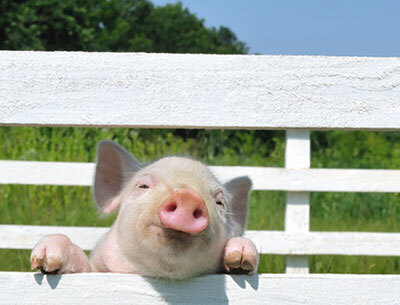 The appellate court found Taylor didn’t smell, didn’t wander outside the yard and didn’t make noise (except for an oink oink here and an oink oink there). Taylor’s expert (a veterinarian) testified that potbellied pigs do not fit veterinarians definition of livestock animals raised for consumption. The Court found Taylor was not livestock and not a nuisance. (2) Taylor’s attorney can now claim he truly brought home the bacon. Association Restrictive Covenants bind the members of the Association. Covenants are necessary for the protection of the members and their property setting up standards and rules for the community. When questions arise, as they often do, about the interpretation or meaning of the Association covenants, courts generally rely on contract law to interpret the Covenants. Litigation, as is illustrated above, often becomes necessary to find out what the meaning is and what to do. As condo and townhouse developments become more popular, clients and associations are calling attorneys with more questions and issues caused by Covenants. If agreement cannot be reached to resolve the issue, litigation or arbitration is used to get a resolution. Our firm represents both Associations and Members of Associations. Sometimes controversies arise between them concerning the Association Restrictive Covenants. Our firm handles such controversies.